This article is about the band. For the singer, see Nena. For other uses, see Nena (disambiguation). Nena[needs German IPA] was a German Neue Deutsche Welle band. 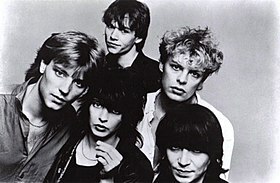 In 1983 and 1984, their German-language song "99 Luftballons" (and its English version, "99 Red Balloons") reached number one in the singles charts of countries around the world. The band was formed in 1982 when vocalist Gabriele Kerner (Nena) came to West Berlin with drummer Rolf Brendel, her boyfriend at the time. There they assembled the other members of the band, which took its name from their lead singer's nickname (Spanish for "little girl"), which she had acquired as a toddler during a family holiday to Spain. The band wrote all of their songs themselves, typically working in pairs. They became overnight sensations in Germany when they performed their debut single "Nur geträumt" on German TV in August 1982, Nena herself wearing a distinctive short red skirt. The single reached number 2 in the German charts, a position it occupied for 6 weeks, and also climbed high in the Austrian, Belgian, Dutch and Swiss charts. In early 1983 the follow-up single "99 Luftballons" spent a further 7 weeks at number 2 before finally reaching the top slot, a position the debut album matched. By the time the band released its second album ? (Fragezeichen) in Germany in January 1984, "99 Luftballons" was starting to climb the US charts, where it reached number 2 and became one of the most successful non-English-language tracks in US Billboard chart history. With the English version of the song ("99 Red Balloons") achieving the number 1 position in the UK, the band became internationally famous and in 1984 gave concerts and made TV appearances in Scandinavia, the UK, Spain and France as well as a 7-date tour (on consecutive nights) of Japan. An international album 99 Luftballons which comprised a combination of English and German versions of tracks from the first two German albums, performed respectably, reaching number 31 in the UK charts in mid-1984. Whilst enjoying international prominence on the back of "99 Luftballons", the band continued to enjoy domestic success in Germany with a string of hits in 1984 and the first half of 1985. The ? (Fragezeichen) album matched the band's debut album in making it to the top spot and spawned two of the band's best-known and most successful singles (the title track and "Rette mich"). They also had success with a couple of songs which would eventually be included on their third studio album, Feuer und Flamme, most notably "Irgendwie, irgendwo, irgendwann". The band was unable to follow up the international success of "99 Luftballons". An English version of "Nur geträumt" ("Just a Dream") failed to make the Billboard Hot 100 and only reached number 70 in the UK charts. A second English album (It's All in the Game, an English version of Feuer und Flamme) failed to chart. The band's fortunes in its homeland also began to turn in the second half of 1985, with disappointing attendance levels at their concerts and their successful chart run ending when the last two singles from Feuer und Flamme failed to chart. The band's fourth and final studio album Eisbrecher ("Icebreaker"), apparently so named because it was intended to smash the mounting indifference the band was encountering, was released in late 1986. Relative to its three predecessors it was a commercial failure as were the two last singles released from the album. Without ever formally announcing a breakup, the band discontinued in 1987. In the same year the marriage of Nena's sister to the band's bassist Jürgen Dehmel ended in divorce and Nena's 8-year relationship with the band's drummer, Rolf Brendel, also ended. After a break from the music scene during which she starred in a film and had a baby boy who died at the age of 11 months, Nena launched her solo career in 1989 going on to enjoy considerable success in Germany, Austria and Switzerland, particularly since 2002. Since the birth of her fifth and final child in 1997, she has toured Germany more or less constantly, at least 50% of her concert setlists typically comprising tracks from the Nena band era. Throughout her solo career, Nena has continued to collaborate with former band members. Firstly, Nena's former boyfriend, Rolf Brendel, supported her as a drummer in the Bongo Girl tour in 1993. Most enduring has been the link with the band's former keyboard player Jörn-Uwe Fahrenkrog-Petersen who appeared with her on stage during the 2005 tour promoting the triple-gold achieving Willst du mit mir gehn album which he had both produced and co-written tracks for before going on to likewise for the 2009 album Made in Germany, which also achieved gold status. The band's former guitarist, Carlo Karges, also wrote tracks for some of Nena's solo albums in the 1990s. He died in 2002, just months before all the band's surviving members reunited on stage to perform "Leuchtturm" during Nena's triumphant Frankfurt concert which coincided with the release of the triple-platinum Nena feat. Nena album which regalvanised her solo career. The surviving members next publicly reunited in 2017 to perform "Nur geträumt" in a television programme marking the 40th anniversary of Nena's first stage appearance. Following the international success of the single "99 Luftballons", the band released 99 Luftballons, a compilation of tracks from its first two albums, with five of the songs in new English-language versions. It's All in the Game is the English-language version of Feuer und Flamme, with lyrics by Canadian singer Lisa Dalbello. 2 3 — — 7 — — — — — "Kino"
3 4 19 — 12 — — 1 — — ? "Ich lieb dich"
99 Luftballons "Ich bleib im Bett"
1984 11 17 — — 37 — — 14 — — ? "Susi K."
"Lass mich dein Pirat sein"
53 — — — 45 — — — — — "Keine Antwort"
— — — — — — — — 70 102 99 Luftballons "Indianer"
— — — — — — — — — — "Ich lieb dich"
— — — — — — — — — — "Kino"
1985 8 18 — — 45 — — 14 — — Feuer und Flamme "Woman on Fire"
43 — — — 47 — — — — — "Ein Brief"
— — — — — — — — — — "Das alte Lied"
— — — — — — — — — — It's All in the Game "Let's Humanize"
"Du kennst die Liebe nicht"
37 — — — 70 — — — — — Eisbrecher "Schön wär es doch"
1987 — — — — — — — — — — "Zusammen"
^ a b c "AllMusic biography – Nena". AllMusic.com. Retrieved 6 November 2014. ^ In the RTL documentary 100 prozent Nena, Nena explains the derivation of her nickname. ^ a b "Discografie Nena". ultratop.be (in Dutch). Hung Medien. Retrieved 26 June 2013. "Chart history of Nena". SwissCharts.com, Hung Medien. Retrieved 26 June 2013. ^ a b c d "Nena discografie" (in Dutch). DutchCharts.nl, Hung Medien. Retrieved 26 June 2013. ^ a b c d "Nene discographie" (in German). AustrianCharts.at, Hung Medien. Retrieved 26 June 2013. ^ a b c "Official German charts – Nena". charts.de. GfK Entertainment. Retrieved 6 November 2014. ^ a b c "UK charts – Nena". Official charts.com. Retrieved 6 November 2014. ^ "Nena tour dates 1984". Nena.de. Retrieved 6 November 2014. ^ "Nena Japan tour dates". Nena.de. Retrieved 6 November 2014. ^ "Allmusic "Eisbrecher" review". Allmusic.com. Retrieved 6 November 2014. ^ "Nena then and now". lostidols.com. Archived from the original on 7 September 2002. Retrieved 6 November 2014. ^ "Wir stritten uns bis aufs Blut". Bunte.de. Bunte. Retrieved 6 November 2014. ^ "Nena tours history and setlists". Nena.de. Retrieved 6 November 2014. ^ "Willst du mit mir gehn credits". Nena.de. Retrieved 6 November 2014. ^ "Made in Germany credits". Nena.de. Retrieved 6 November 2014. ^ "Nena: Reunion mit der alten Band". Klatsch-tratsch.de. Retrieved 28 September 2017. "Album chart history of Nena". MusicLine.de (in German). Media Control Charts. Retrieved 26 June 2013. "Album chart history for Nena" (in German). Charts.de, Media Control. Retrieved 26 June 2013. ^ a b "Chart history of Nena". NorwegianCharts.com, Hung Medien. Retrieved 26 June 2013. ^ a b c "Chart history of Nena". SwedishCharts.com, Hung Medien. Retrieved 26 June 2013. ^ a b c Select "Albums" or "Singles" tab:* "Nena – Official Charts Company". Official Charts Company. Retrieved 26 June 2013. "Awards received by Nena". Allmusic. Retrieved 26 June 2013. "Billboard Magazine Archive". Billboard, Prometheus Global Media. Retrieved 30 June 2013. "Billboard 200". Billboard, Prometheus Global Media. Retrieved 30 June 2013. ^ "Nena" (in German). Nena.de. Retrieved 26 June 2013. "Gold-/Platin-Datenbank (Nena; 'Nena')" (in German). Bundesverband Musikindustrie. ^ "? (Fragezeichen)" (in German). Nena.de. Retrieved 28 June 2013. ^ "Feuer und Flamme". Nena.de. Retrieved 3 July 2013. ^ "Eisbrecher". Nena.de. Retrieved 3 July 2013. ^ "99 Luftballons". Nena.de. Retrieved 30 June 2013. ^ a b "Canadian certifications – Nena". Music Canada. Retrieved 27 June 2013. ^ "It's All in the Game". Nena.de. Retrieved 3 July 2013. "Singles chart history of Nena". MusicLine.de (in German). Media Control Charts. Retrieved 28 June 2013. "Singles chart history for Nena" (in German). Charts.de, Media Control. Retrieved 26 June 2013. ^ "Top Singles - Volume 39, No. 26". RPM. 3 March 1984. Retrieved 6 July 2011. ^ ""99 Luftballons" by Nena". Charts.org.nz. Retrieved 27 June 2013. "Billboard Hot 100". Billboard, Prometheus Global Media. Retrieved 30 June 2013. ^ "Certified Awards Search" (To access, enter the search parameter "Nena" and select "Search by Keyword"). British Phonographic Industry. Retrieved 27 June 2013.